Before Christmas we took a trip to Amelia Island (http://www.plainchicken.com/2014/12/amelia-island-fl-sweet-spicy-pecans.html). We decided to go a day early and detour through Savannah. We love Savannah. There are so many places to see, eat and drink! We hit a ton of spots earlier in the year (http://www.plainchicken.com/2014/05/24-hours-in-savannah-ga.html) but still had several places to mark off our list. We got to check out 4 new places this time. 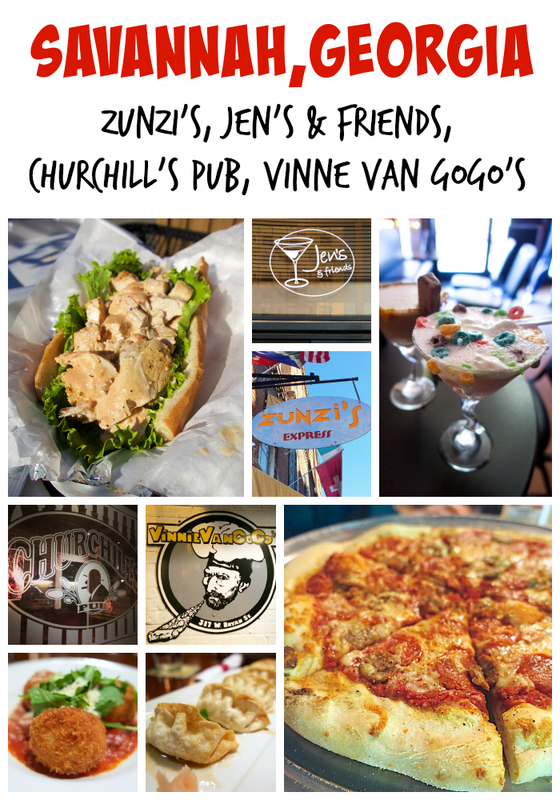 Zunzi's, Churchill's Pub, Jen's and Friends, and Vinnie Van GoGo's. 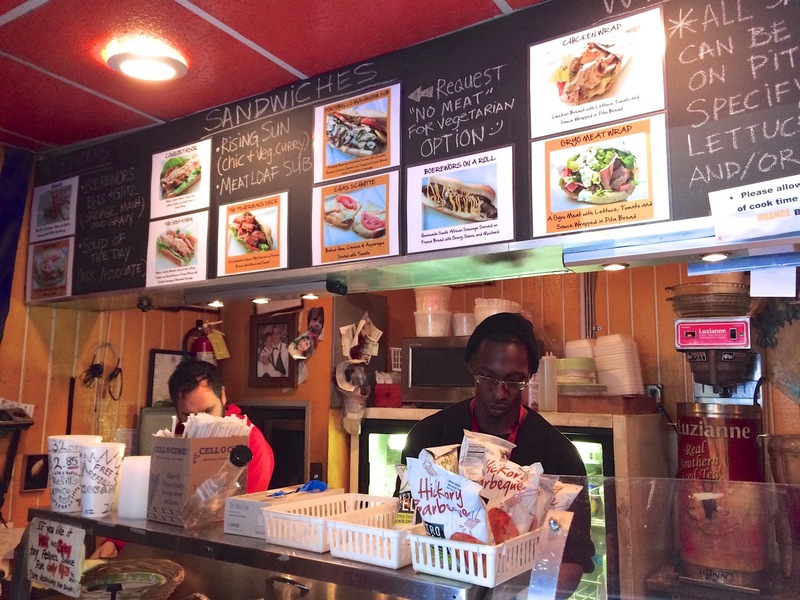 Zunzi's is basically a hole in the wall with the most amazing sandwiches. 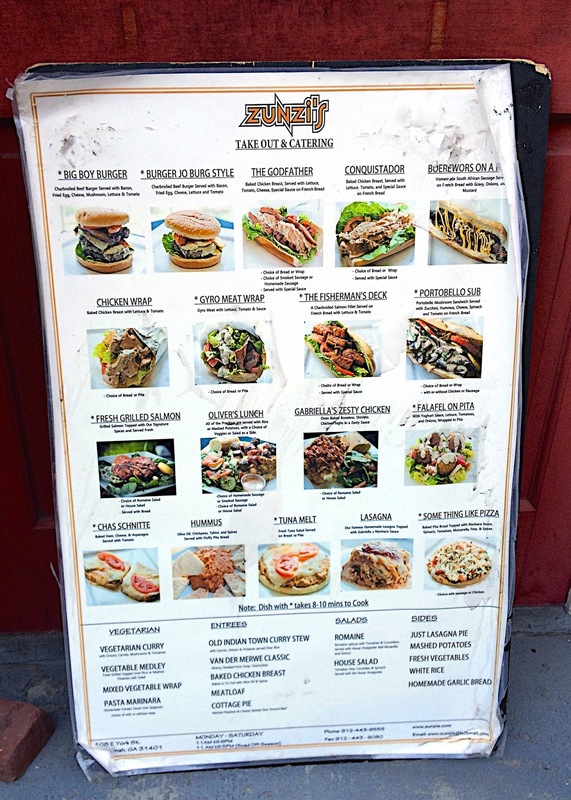 I did my research before we left and read that The Conquistador was the most popular sandwich. 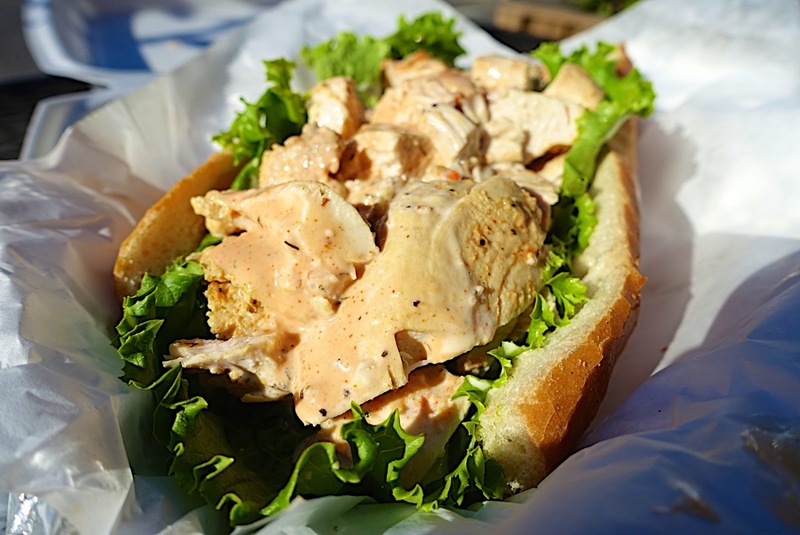 The Conquistador is chicken, lettuce, tomato, and sauce on soft french bread. It was TO-DIE-FOR! I could drink the sauce. The sandwich is pretty big, so we split it. We wanted to have room for snacks and dinner. Next time we will definitely get extra sauce! We stopped in Jen's and Friends for a couple of martinis. It is a super tiny bar, but they have an extensive martini list. I read that they have over 300 martinis on the menu. We got the Froot Loop martini and the Snicker's martini. If we had to pick a favorite, we both said we would pick the Froot Loop. 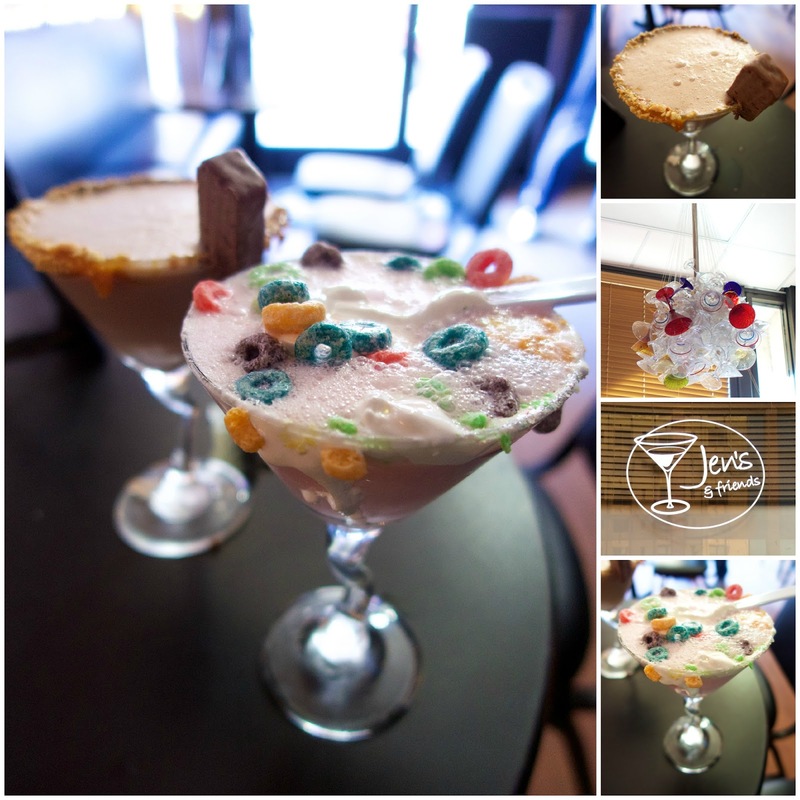 Next time I want to try the Rice Krispie martini. It is rimmed with Rice Krispies and has a Rice Krispie Treat garnish! Churchill's Pub is a great English Pub. 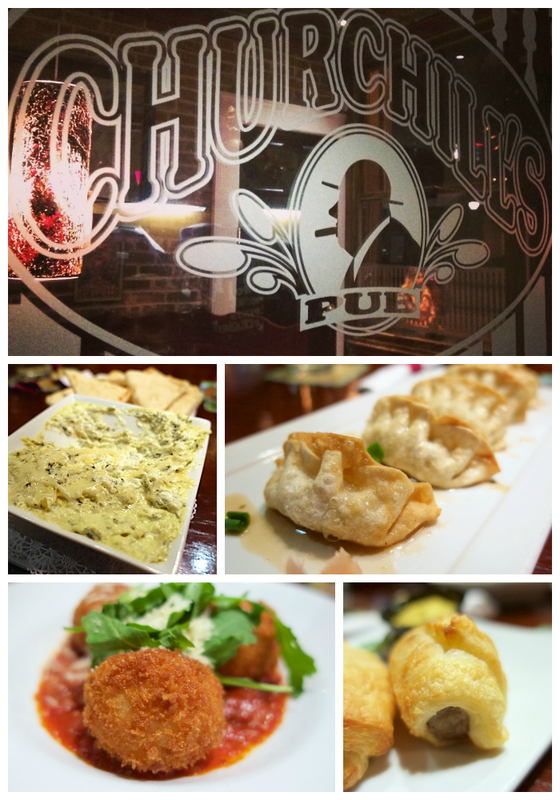 We are really into English Pubs since we had such a great time at the English Pub in Epcot in November. We had a few drinks in us, so we decided to get some snacks. We got the Arancini, Spinach and Artichoke Dip, Chicken and Vegetable Potstickers, and English Sausage Rolls. Everything was delicious. I'd love to go back for dinner on another trip. We walked past Vinnie Van GoGo's on the way to our hotel on our last trip to Savannah. It smelled so good and was super busy. I knew I had to try it on my next trip to Savannah. The pizza was worth the wait. We loved it. The sauce was a little sweet and the crust was crispy and chewy. 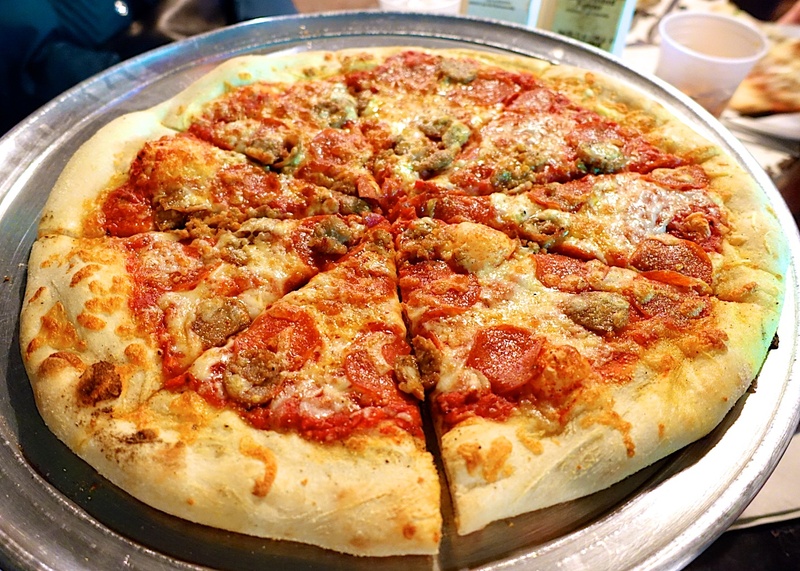 I ate WAY too much pizza, but I enjoyed every single bite. Chicken Legs and I split a whole pizza. 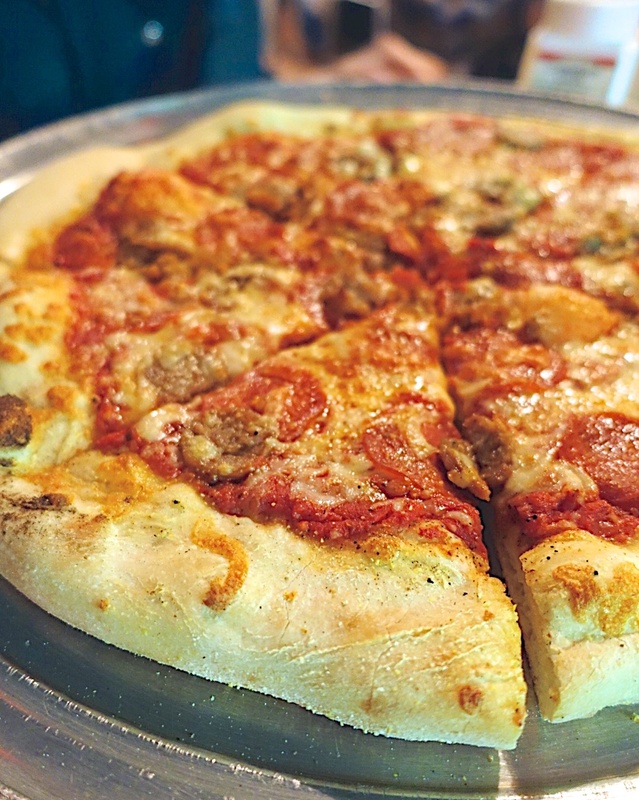 We got our standard - sausage and pepperoni. They also also large slices if you don't want to have a whole pizza. Vinnie Van GoGo's only takes cash - so make sure you have some. What should be on our list for our next visit?? Looks like you had an eating good time. These look great! I'm compiling a list from all your Savannah posts for this summer when we go. I've had several people suggest "Coco's on Tybee". have you eaten there? I've never been to Coco's - I need to add it to our list too! We live here now. Alligator Soul is my favorite fine dining.AJs on Tyner is great for a casual meal. Akisha - Alligator Soul is on our list. Hoping to get there next time. 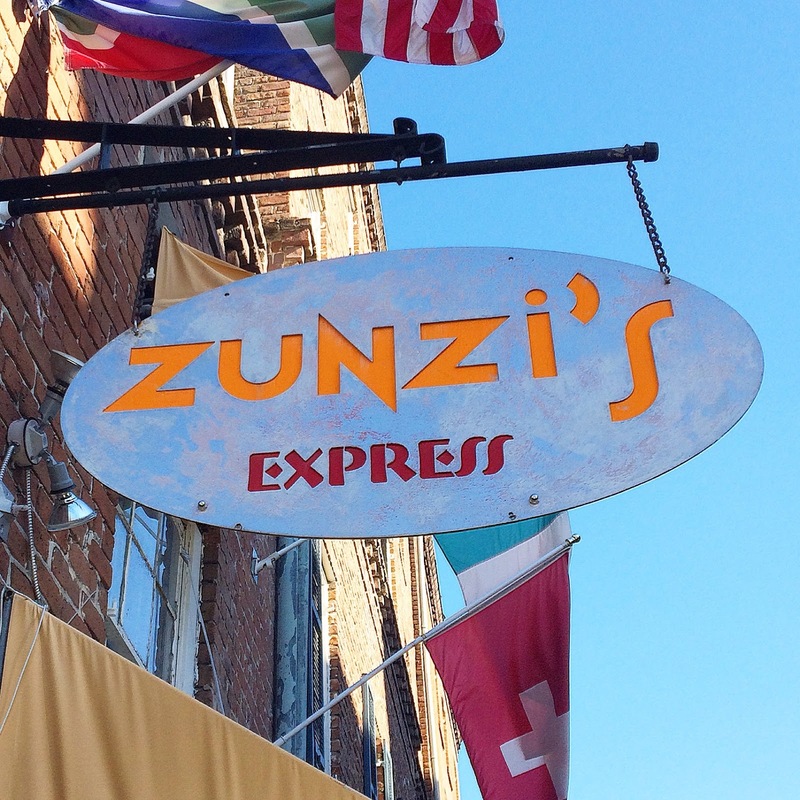 Did you try the South African tea at Zunzi's? It's amazing! I tried to buy some and recreate it at home, but it tasted like tobacco. My husband and I went to Jen's and Friends on our first date. We ended up making out until they closed the place and turned the lights on. The bartender was calling, "Looooovebirds!" in a singsong voice. We still laugh about that and just the name brings back fond memories, even though we haven't been there in over 6 years. 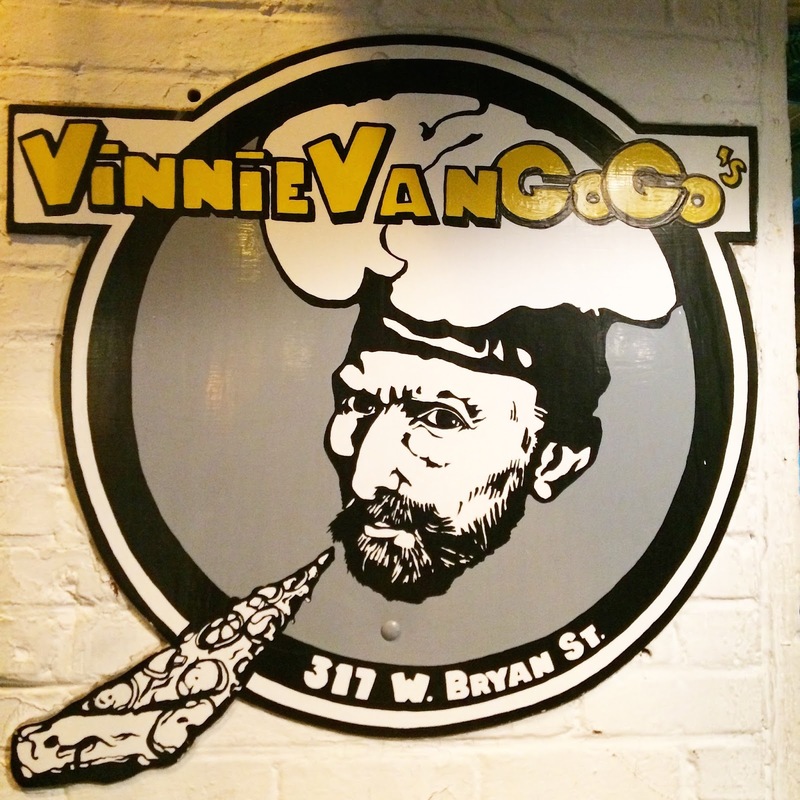 Glad you finally got to try Vinnie-Van-Go-Gos! That's still our favorite pizza to date. :) Next time be sure to try the Sweet Spice. It's a little hole in the wall Jamaican Restaurant with AMAZING curry chicken, curry shrimp, plantains, and the best ginger drink I have ever had in my life! Planning a trip to Savannah either this spring or summer. Will be getting those martinis!!! 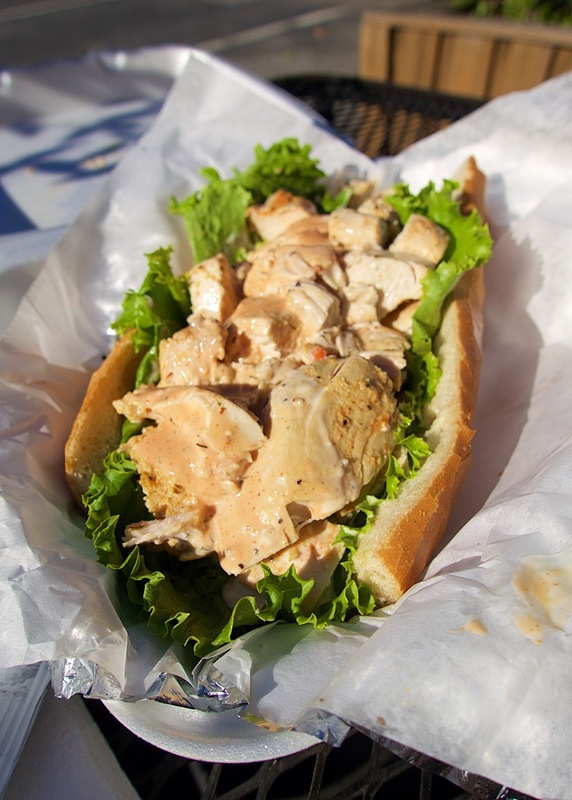 I would a trip to Savannah just for a Conquistador from Zunzi's! Love that sandwich!